Whoosa vicious helpful predator? You are! Yes you are! Humans may be Earth’s apex predator, but the fleeting shadow of a vulture or the glimpse of a big cat can cause instinctive fear and disdain. But new evidence suggests that predators and scavengers are much more beneficial to humans than commonly believed, and that their loss may have greater consequences than we have imagined. Conflict between these species and people, coupled with dramatic habitat loss, is causing unprecedented predator and scavenger declines. Nearly three-fourths of all vulture species are on a downward spiral. African lions are projected to lose half of their range in the coming decades and leopards have lost upwards of 75% of their historic range. Many bat species are facing extinction. In a recent paper in Nature Ecology & Evolution, we summarised recent studies across the globe looking at the services predators and scavengers can provide, from waste disposal to reducing car crashes. Animals that eat meat play vital roles in our ecosystems. One of the most outstanding examples we found was that of agricultural services by flying predators, such as insectivorous birds and bats. We found studies that showed bats saving US corn farmers over US$1 billion in pest control because they consume pest moths and beetles. Similarly, we found that without birds and bats in coffee plantations of Sulawesi, coffee profits are reduced by US$730 per hectare. Why do some graziers want to retain, not kill, dingoes? It’s not just birds and bats that help farmers. 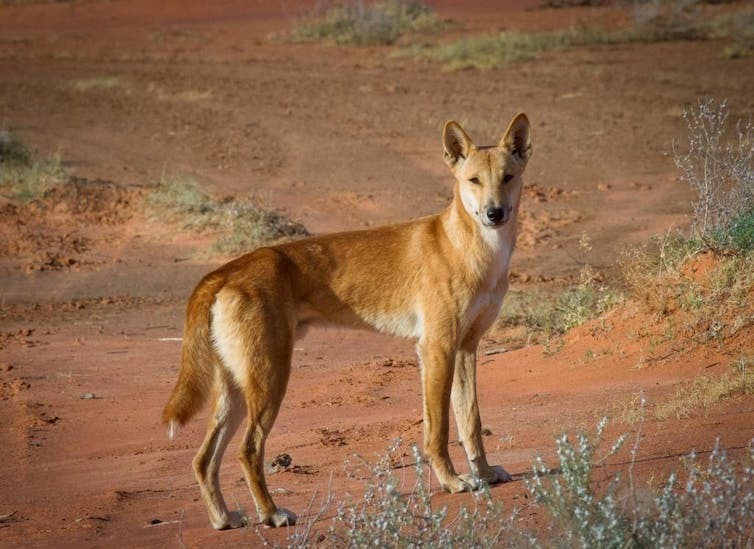 In Australia, dingoes increase cattle productivity by reducing kangaroo populations that compete for rangeland grasses (even when accounting for dingoes eating cattle calves). This challenges the notion that dingoes are solely vermin. Rather, they provide a mixture of both costs and benefits, and in some cases their benefits outweigh the costs. This is particularly important as dingoes have been a source of conflict for decades. Predators and scavengers also significantly reduce waste in and around human habitation. This keeps down waste control costs and even reduces disease risk. For example, golden jackals reduce nearly 4,000 tons of domestic animal waste per year in Serbia and over 13,000 tons across urban areas in Europe. Vultures can reduce over 20% of organic waste in areas of the Middle East. In India, vultures have been implicated in reducing rabies risk by reducing the carcasses that sustain the stray dog population. One piece of research showed that if mountain lions were recolonised in the eastern United States, they would prey on enough deer to reduce deer-vehicle collisions by 22% a year. This would save 150 lives and more than US$2 billion in damages. Although these species provide clear benefits, there are well known costs associated with predators and scavengers as well. Many predators and scavengers are a source of conflict, whether it is perceived or real; particularly pertinent in Australia is the ongoing debate over the risk of shark attacks. These drastic costs of predators and scavengers are rare, yet they attract rapt media attention. Nevertheless, many predators and scavengers are rapidly declining due to their poor reputation, habitat loss and a changing climate. It’s time for a change in the conservation conversation to move from simply discussing the societal costs of predators and scavengers to a serious discussion of the important services that these animals provide in areas we share. Even though we may rightly or wrongly fear these species, there’s no doubt that we need them. The authors would like to acknowledge the contributions of Dr Hawthorne Beyer and Alexander Braczkowski. A boobook enjoys its vantage point, courtesy of humans. If you have ever been to a nature reserve in Africa, you may have been lucky enough to see predators on a kill – maybe something spectacular like lions on a giraffe. The chances are you got to see that because the predators killed the prey right on the road, where you could get up close in your car or safari vehicle. Lions gathered on a road in a South African National Park. But what if this was not just luck? What if lions had greater hunting success along a road because their prey slip on the tarmac, stumble and fall, thus becoming a meal? The road – a human intrusion in a natural world – could be increasing the predators’ hunting success. This intriguing idea led us to wonder if there were other examples in which human structures or environments might benefit predators – a group of animals that would otherwise appear to want as little to do with humans and their world as possible. Ecosystems are dynamic, which means that new ones can arise when species occur in combinations and numbers that have not happened before. While we often (rightly) have a very negative view of our impact on the natural world, sometimes organisms can surprise us by taking advantage of what we do and creating a successful space for themselves in a human world. Once we started looking, we found other examples of predators exploiting these niches. We found four ways, with much overlap, that predators take advantage of human habitats to improve their hunting success. First, certain animal species follow human settlements and can provide a completely new food source for predators. Rodents (rats and mice) and invasive birds (such as sparrows or starlings) exploit resources around towns. Pets and livestock are also commonly taken by predators such as bears, wolves, foxes and dingoes. Lions have learned to use cowbells to locate livestock, and may have increased hunting success using gravel and tarmac roads to chase prey. Second, potential prey species often gather around artificial resources, reducing commute times for predators and increasing their hunting success. For example, European kestrels ambush populations of bats and swifts as they leave their roosts in building ventilation. Two species of sea lion have learned to travel 100km up the Columbia River in the United States to hunt masses of migrating salmon that gather at fish ladders (structures that help fish go over or around dams or other barriers when migrating upriver to spawn) over the Bonneville Dam. Brown bears, meanwhile, hunt at fish weirs, trapping congregations of fish against these to prevent their escape. Third, structures we build or things we do can make prey species more vulnerable. African wild dogs take down larger prey when they chase them into fences, and dingoes exploit roadkill along major highways. Horse-eye jack fish ambush prey around dock pilings that interrupt the synchronised escape behaviour of the fish schools. Peregrine falcons in New York city hunt at night as they have more success catching pigeons that are bedazzled by skyscraper lights. Lions have learned to use cowbells to locate livestock. Here in Australia wedge-tailed eagles follow harvesters on farms to catch animals flushed out by the machinery. Finally, some predators also use resources that we provide as tools to aid their hunting. Some birds use human refuse to lure fish to their doom and many raptors use lampposts and aerials as perches, increasing their hunting success. Larger species such as cheetah and leopards similarly exploit our presence to hunt more successfully. Only a few studies have tried to quantify the benefits of human environments for predators, identifying how they experience increased hunting success, reduced energy expenditure, or increased reproductive output. Such benefits can ultimately lead to increased population sizes, as has happened with the New York kestrel population and Chicago’s coyotes. We predict that some predators are likely to become more abundant in our lives, which could have both positive and negative implications. For example, they are important biocontrol agents and do a great job of suppressing rodent populations. However, interactions with large predators can be dangerous for humans. Letting humans do the hard work. Predators can be vital for maintaining a balanced ecosystem. However, predator species can have a huge effect on their environment, even when there are only a few of them about. Predator species can easily become invasive animals, as we have seen with the introduction of cats into Australia or brown tree snakes onto the island of Guam. These predators have had devastating consequences for whole ecosystems, and our actions may be unwittingly increasing their advantages over prey species, as has been made evident by ravens using human-built perches to predate heavily on desert tortoises. Similarly, animals using road underpasses are more vulnerable to introduced red foxes as the foxes – clever animals – soon learn to wait at the underpass exit for a meal delivery. Our presence and the way we alter our environment can therefore thwart conservation of threatened species, despite our best attempts. We need to carefully consider how we influence our environment, and be on the lookout for instances where predators are making use of novel niches to exploit prey species. Even the smallest changes we make can affect a whole landscape, and can make prey animals more vulnerable. Dingoes can help manage devastating red fox and feral cat numbers, but only if we let enough of them live in key areas. Dingoes could be the key to controlling red foxes and other invasive predators, but only if we encourage them in large enough numbers over a wide enough area, our research shows. Interest in re-introducing or restoring top predators, like dingoes and wolves, has been fuelled by recent studies demonstrating their important roles in their ecosystems. They can especially be vital in suppressing the abundance of lower-order competitors or “mesopredators”, like red foxes and possibly feral cats (which can have devastating effects on native species). But researchers have found top predators aren’t always successful in reducing mesopredator numbers. Until now, such variation has been linked to human presence, land-use changes and environmental factors such as landscape productivity. However, our research, published yesterday in Nature Communications, found that a key factor for success is high numbers of dingoes and wolves across their natural range. If you look at how species are typically distributed across a landscape – their range – ecological theory predicts there’ll be lower numbers at the outer edges of their range. If you do need large numbers of top predators to effectively suppress mesopredators, the core of their range is potentially the best place to look. We tested this idea, looking at the dingo in Australia and the grey wolf in North America and Europe. The mesopredators included the red fox in Australia, the coyote in North America and the golden jackal in Europe. We looked at three regions in our study. Predator distribution is shown for: a) coyotes (hashed) and grey wolves (orange) in Saskatchewan, North America (present day); b) golden jackals (hashed) and grey wolves (orange) in Bulgaria and Serbia (present day); and c) red foxes (hashed) and dingoes (orange) in Queensland, Australia (in the 1950s). We used information from bounty hunting programs, as these provide data on predator numbers across a wide geographical area. In the case of Australia we used historic data from the 1950s, as this is the most recent reliable information about red fox and dingo distribution. The actual population numbers of red foxes and dingoes have changed substantially since then, but the nature of their interactions – which is what we were investigating – has not. We determined that top predators exist in higher numbers at the core of their ranges in comparison to the edges. We then looked at mesopredator numbers across the range edges of their respective top predator. Predator bounties and top predator range edges in each continent. The number of bounties (representing the number of animals killed) are given for each hunting unit in North America (collated from 1982 to 2011) and Europe (collated from 2000 to 2009), whereas each square in Australia represents the number of bounties in a 100-by-100km area (collated from 1951 to 1952). Top predators are in a–c. Mesopredators are in d–f. Darker colours within each hunting unit indicate greater bounty return numbers and, by inference, a higher abundance for the respective predator. Dashed black lines indicate top predator range edges. Australia was divided into two sections for the analysis (east and west) as shown. The results, which were consistent across the three continents, suggest that top predators can suppress mesopredators effectively (even completely) but only in the core of their geographic range, where their numbers are highest. In other words, abundant top predators can exert disproportionate mesopredator control once their numbers increase past a certain point. Example of the results from Australia (western side of Queensland). The blue lines indicate the abundance of each predator (note that the values on the y-axis are scaled so do not reflect actual numbers). The black dashed line indicates where there is a sharp change in predator abundance (the breakpoint). The red dashed lines indicate 95% confidence intervals (a measure of uncertainty) either side of the breakpoint. Distance values less than zero relate to areas outside the dingoes’ range, while distance values greater than zero relate to areas within the range. In summary, abundances of the red fox decline sharply as you move further into the range of the dingo. The relationship we uncovered is now formalised as the “Enemy Constraint Hypothesis”. It could apply to other predator dyads, where two animals compete for similar resources – even relationships involving parasites and pathogens. Our findings are important for understanding species interactions and niches, as well as the ecological role of top predators. It could explain why other studies have found top predators have little influence on mesopredators: they were looking at the edge, not the core, of the top predators’ range. This is a conceptual model of the Enemy Constraint Hypothesis. On the edge of a top predator’s range, mesopredator abundance should decline as top predator numbers increase. The breakpoint for the mesopredator indicates where their population nears zero. 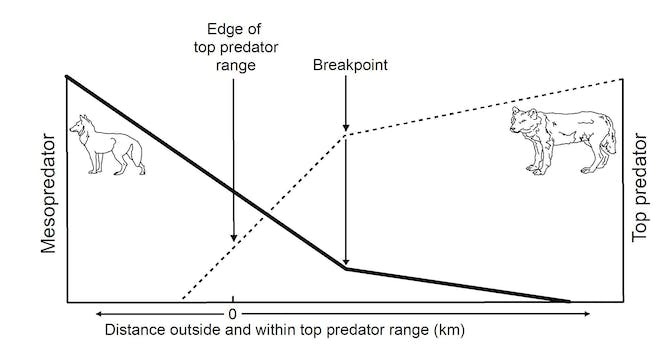 The breakpoint for the top predator indicates where their abundance starts to decline sharply on the edge of the range. How many top predators do we need? Dingoes can be vital for reducing red fox and possibly feral cat numbers. In our case studies the ranges of each top predator were limited primarily by human use of the land and intensive shooting, trapping and poisoning. Killing pack animals like dingoes can fracture social groups, potentially altering their natural behaviour and interactions with other species. Future studies on predator interactions therefore need to consider the extent to which the animals are acting in response to human intervention. If we want to benefit from the presence of top predators, we need to rethink our approach to management – especially where they are subjected to broad-scale control, as the dingo is in some parts of Australia. Changing our relationship with top predators would not come without its challenges, but high extinction rates around the world (and especially in Australia) clearly indicate that we urgently need to change something. If this includes restoring top predators, then we need to think big. Invasive species are a threat to wildlife across the globe – and invasive, predatory mammals are particularly damaging. Our research, recently published in Proceedings of the National Academy of Sciences, shows that these predators – cats, rats and foxes, but also house mice, possums and many others – have contributed to around 60% of bird, mammal and reptile extinctions. The worst offenders are feral cats, contributing to over 60 extinctions. So how can we stop these mammals eating away at our threatened wildlife? Our study revealed that invasive predators are implicated in 87 bird, 45 mammal and 10 reptile extinctions — 58% of these groups’ contemporary extinctions worldwide. Invasive predators also threaten 596 species classed as vulnerable, endangered or critically endangered on the International Union for the Conservation of Nature Red List. Combined, the affected species include 400 birds, 189 mammals and 149 reptiles. Twenty-three of the critically endangered species are classed as “possibly extinct”, so the number of extinctions above is likely to be an underestimate. Until now, these shocking statistics have been unknown, and the heavy toll of invasive predators on native biodiversity grossly underappreciated. 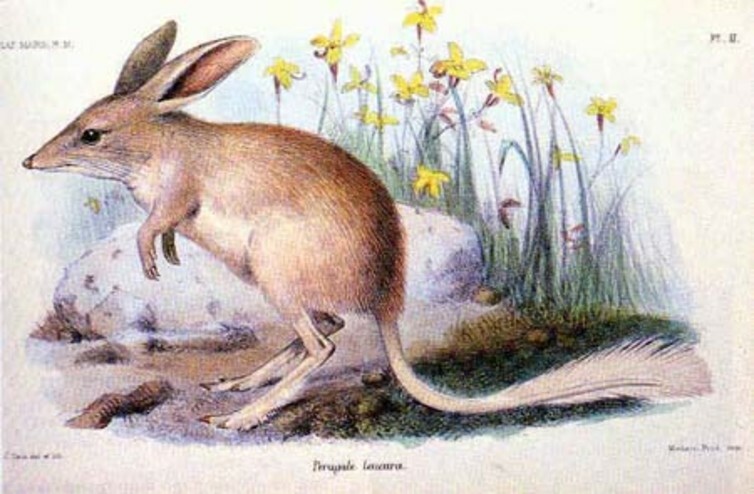 Species extinctions attributed to invasive predators include the Hawaiian rail (Zapornia sandwichensis) and Australia’s lesser bilby (Macrotis leucura). Australia’s lesser bilby, now extinct. We found that three canids (including the red fox and feral dogs), seven members of the weasel family or mustelids (such as stoats), five rodents, two primates, two mongooses, two marsupials and nine species from other families negatively impact threatened species. Some of these species, such as hedgehogs and brushtail possums, don’t immediately spring to mind as predators, yet they are known to prey on many threatened species. Feral cats threaten the most species overall (430), including 63 that have become extinct. This equates to one-quarter of all bird, mammal and reptile extinctions – making the feral cat arguably the most damaging invasive species for animal biodiversity worldwide. Five species of introduced rodent collectively threaten 420 species, including 75 extinctions. While we didn’t separate out the impacts of individual rodent species, previous work shows that black rats (Rattus rattus) threaten the greatest number of species, followed by brown rats (R. norvegicus) and Pacific rats (R. exulans). The humble house mouse (Mus musculus) is another interesting case. Despite their small size, house mice have been recorded eating live chicks of albatrosses, petrels and shearwaters. 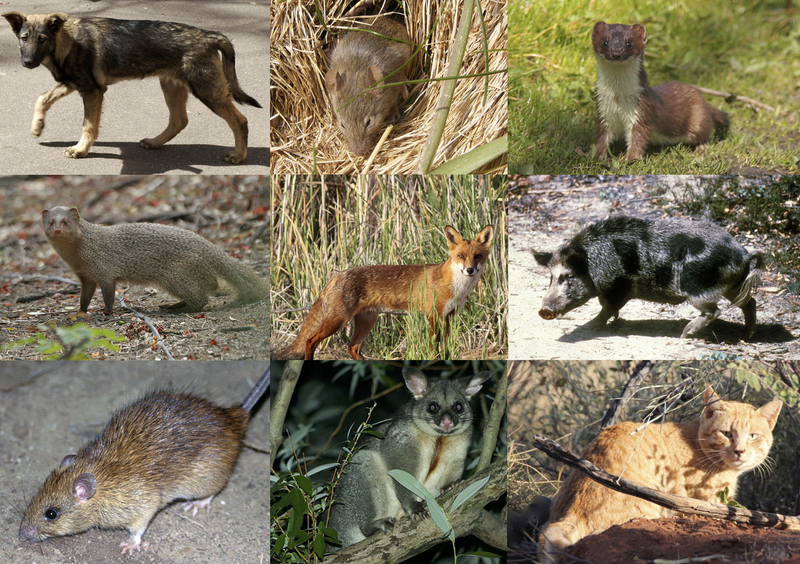 Other predators that threaten large numbers of species are the domestic dog (Canis familiaris), pig (Sus scrofa), small Indian mongoose (Herpestes auropunctatus), red fox (Vulpes vulpes) and stoat (Mustela erminea). Invasive mammalian predators (clockwise from top left): feral dog, house mouse, stoat, feral pig, feral cat, brushtail possum, black rat, small Indian mongoose and red fox (centre). Clockwise from top-left: Andrey flickr CC BY 2.0 https://flic.kr/p/4M2E7y; Richard Adams flickr CC BY 2.0 https://flic.kr/p/7U19v9; Mark Kilner flickr CC BY-NC-SA 2.0 https://flic.kr/p/4D6LPe; CSIRO CC BY 3.0 http://www.scienceimage.csiro.au/image/1515; T. Doherty; Toby Hudson CC BY-SA 3.0 https://commons.wikimedia.org/wiki/File:BrushtailPossum.jpg; CSIRO CC BY 3.0 http://www.scienceimage.csiro.au/image/10564; J.M.Garg CC BY-SA 3.0 https://commons.wikimedia.org/wiki/File:Herpestes_edwardsii_at_Hyderaba.jpg; Harley Kingston CC BY 2.0 https://flic.kr/p/ceWFr7 (centre). Species found only on islands (insular endemics) account for 81% of the threatened species at risk from predators. The isolation of many islands and a lack of natural predators mean that insular species are often naive about new predators and lack appropriate defensive responses. This makes them highly vulnerable to being eaten and in turn suffering rapid population decline or, worse, extinction. The high extinction rates of ground-dwelling birds in Hawaii and New Zealand — both of which lack native mammalian predators — are well-known examples. Accordingly, the regions where the predators threatened the greatest number of species were all dominated by islands – Central America and the Caribbean, islands of the Pacific, the Madagascar region, New Zealand and Hawaii. Conversely, the continental regions of North and South America, Europe, Africa and Asia contain comparatively few species threatened by invasive predators. While Australia is a continent, it is also an island, where large numbers of native birds and mammals are threatened by cats and foxes. 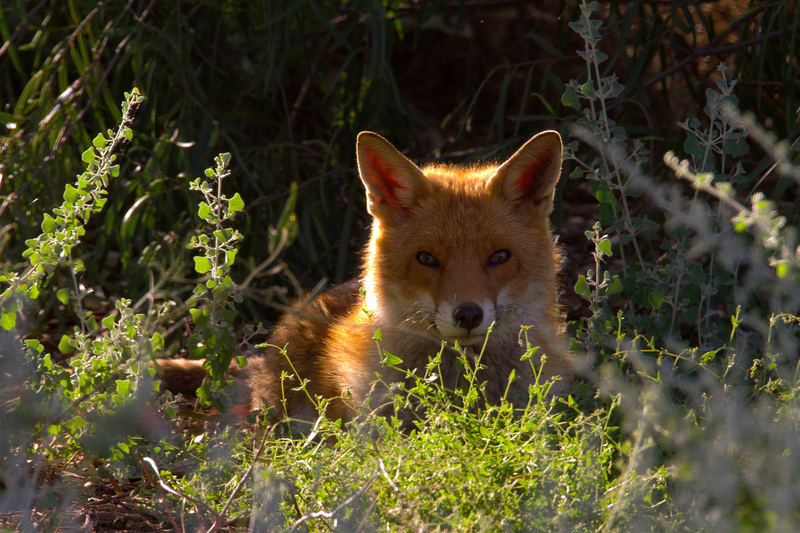 Along with feral cats, red foxes have devastated native mammals in Australia. Understanding and mitigating the impact of invasive mammal predators is essential for reducing the rate of global biodiversity loss. Because most of the threatened species studied here live on islands, managing invasive predators on islands should be a global conservation priority. Invasive predators occur on hundreds of islands and predator control and eradication are costly exercises. Thus, it is important to prioritise island eradications based on feasibility, cost, likelihood of success and potential benefits. On continents or large islands where eradications are difficult, other approaches are needed. This includes predator-proof fencing, top-predator restoration and conservation, lethal control, and maintenance of habitat structure. Despite the shocking statistics we have revealed, there remain many unknowns. For example, only around 40% of reptile species have been assessed for the Red List, compared to 99% for birds and mammals. Very little is known about the impact of invasive predators on invertebrate species. We expect that the number of species affected by invasive predators will climb as more knowledge becomes available. This article was co-authored by Al Glen from Landcare Research, New Zealand. If you knew that there was zero percent chance of being eaten by a shark, would you swim more often? Rhetorical questions aside, the fear of being eaten has a profound influence on other animals too, and on the way they use marine environments. Turtles, for example, fear being eaten by sharks and this restricts the movement and behaviour of entire populations. But when the fear of being eaten dissipates, we see that turtles eat more, breed more, and go wherever they please. It might sound like turtle paradise, but in an article published today in Nature Climate Change we show that loss of ocean predators can have serious, cascading effects on oceanic carbon storage and, by extension, climate change. For a long time we’ve known that changes to the structure of food webs – particularly due to loss of top predators – can alter ecosystem function. This happens most notably in situations where loss of predators at the top of the food chain releases organisms lower in the food chain from top-down regulatory control. For instance, the loss of a predator may allow numbers of its prey to increase, which may eat more of their prey, and so on. This is known as “trophic downgrading”. With the loss of some 90% of the ocean’s top predators, trophic downgrading has become all too common. This upsets ecosystems, but in our article we also report its effects on the capacity of the oceans to trap and store carbon. This can occur in multiple ecosystems, with the most striking examples in the coastal zone. This is where the majority of the ocean’s carbon is stored, within seagrass, saltmarsh and mangrove ecosystems – commonly known as “blue carbon” ecosystems. Blue carbon ecosystems capture and store carbon 40 times faster than tropical rainforests (such as the Amazon) and can store the carbon for thousands of years. This makes them one of the most effective carbon sinks on the planet. Despite occupying less that 1% of the sea floor, it is estimated that coastal blue carbon ecosystems sequester more than half the ocean’s carbon. The carbon that blue carbon ecosystems store is bound within the bodies of plants and within the ground. When predators such as sharks and other large fish are removed from blue carbon ecosystems, resulting increases in plant-eating organisms can destroy the capacity of blue carbon habitats to sequester carbon. For example, in seagrass meadows of Bermuda and Indonesia, less predation on herbivores has resulted in spectacular losses of vegetation, with removal of 90–100% of the above-ground vegetation. Such losses of vegetation can also destabilise carbon that has been buried and accumulated over millions of years. For example, a 1.5-square-kilometre die-off of saltmarsh in Cape Cod, Massachusetts, caused by recreational overharvesting of predatory fish and crabs, freed around 248,000 tonnes of below-ground carbon. If only 1% of the global area of blue carbon ecosystems were affected by trophic cascades as in the latter example, this could result in around 460 million tonnes of CO2 being released annually, which is equivalent to the annual CO2 emissions of around 97 million cars, or just a bit less than Australia’s current annual greenhouse gas emissions. So what can be done? Stronger conservation efforts and modification of fishing regulations can help restore marine predator populations, and thereby help maintain the important indirect role that predators play in climate change mitigation. It’s about restoring balance so that we have, for example, healthy and natural numbers of both sea turtles and sharks. Policy and management need to reflect this important realisation as a matter of urgency. More than 100 million sharks may be killed in fisheries each year, but if we can grant these predators great protection they may just help to save us in return.